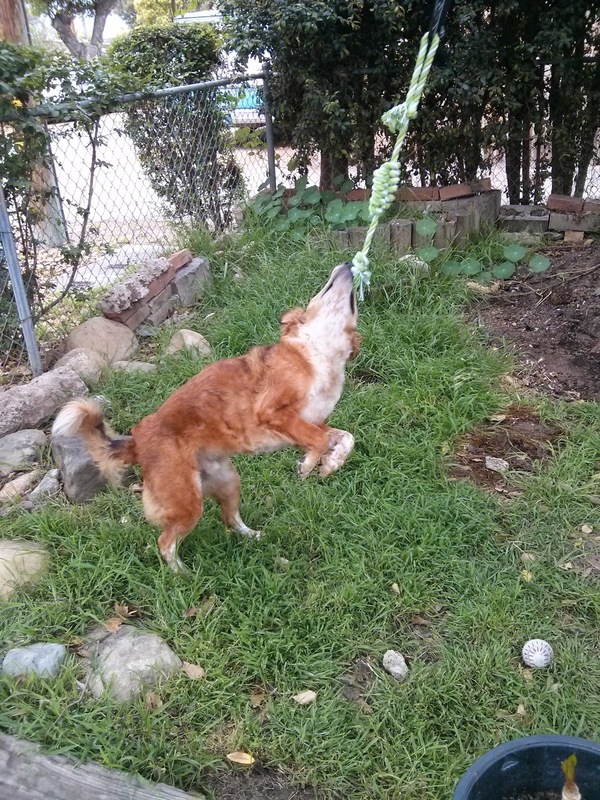 The Dog Geek: Cheapass Dog Fun: Make a Springpole! A springpole is a resistance tugging toy for a dog, but it actually requires neither a spring nor a pole. Mine is made from a couple of old bike tire tubes and some nylon webbing that has its own little backstory*. Making a springpole can be incredibly easy and cheap, or it can require some serious construction. 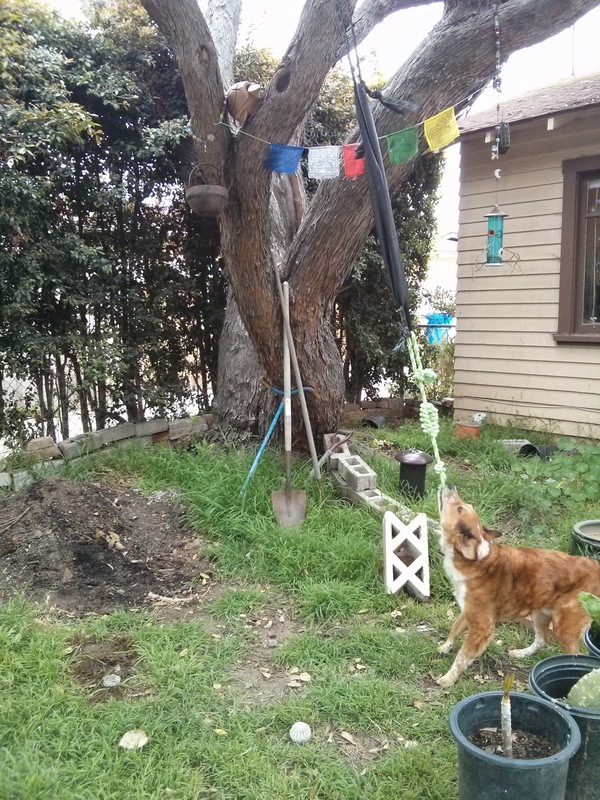 It all depends on the person building it and the dog that will be playing with it. The tug toy that tugs back! A springpole is another lazy way to exercise a dog, right up there with lurecoursing and flirtpole. The springy or stretchy thing in the middle provides resistance so when the dog tugs, the toy tugs back. Making Brisbane's springpole took perhaps five minutes. (It contains neither a spring nor a pole, as my husband helpfully pointed out.) First I walked across the street to the bicycle shop and asked for a couple of punctured inner tubes, one was longer than the other so I tied a knot in it to even them out. Then I cut a length of nylon webbing tossed it over a tree branch, and tied it to the tubes. 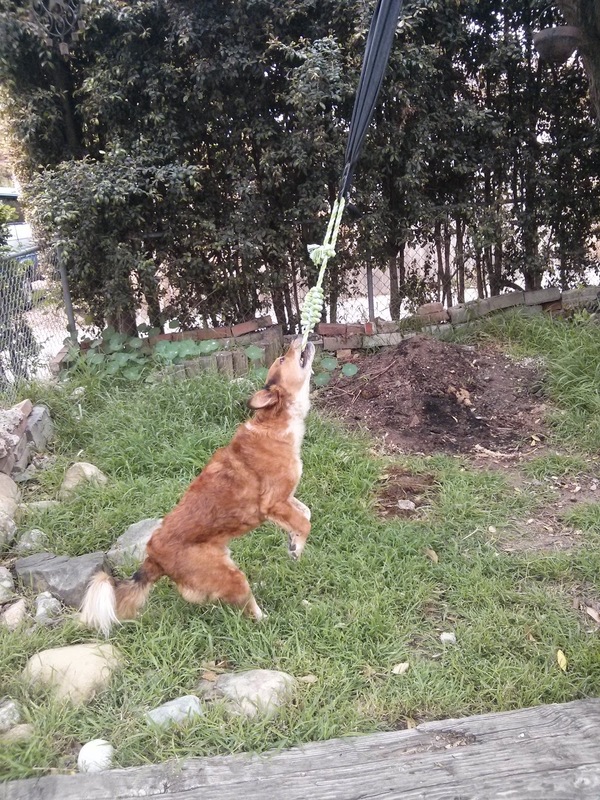 I had Brisbane stand on his hind legs so I could see how high to hang the toy, and then tied that on. Done. I read in a Clean Run agility magazine many years ago that tugging with front feet off the ground or barely touching is great for a dog's core muscles, and particularly awesome for dogs with long backs. I've seen plenty of pictures and videos of pitbulls hanging off these things and flying through the air, but Brisbane is seriously injury-prone and I needed to hang his toy where he can get it while keeping at least some feet on the ground. This is a great setup for Brisbane, but I would need ti think about using car tire tubes and hanging it a lot higher if I had an athletic pitbull or a larger dog. Many people use garage door springs, but this person used a smaller one for her less-intense tuggers, and here someone with a Viszla puppy used a little storm door spring and a plant hangar. If I were to make a springpole for Ru I might use a bungee cord or a exercise resistance band and mount it in a door frame for indoor chihuahua fun. This tutorial begins with building a sturdy frame to hang the springpole, starting with setting posts in cement. This would be a great option for a yard with no trees, and dogs that need something sturdier than a plant hangar mounted on a fence. I'm guessing a hangar for a punching bag or some other sort of workout equipment frame would work well for a seriously athletic larger dog. I own a large spool of heavy duty nylon webbing, used to make Teva sandles. This stuff is amazing and I will probably using it to make harnesses and leashes eventually. The spool of nylon webbing has its own story, and may eventually get its own post. Many years ago, my father-in-law worked for the Teva sandal company and acquired a giant spool of sandal strapping. A few years later while cleaning out the garage, he dumped it on the curb with the garbage. I spotted it while stopping by to visit my then-boyfriend, and threw it in my trunk. The spool traveled with me to college, where my friends and I used bits of it to tie things to the roofs of our cars, suspend stuff from the garage ceiling, and generally kludge things together in college-student fashion. When I graduated and got ready to move home, I left the spool in a pile of stuff at the curb, where one of my friends scavenged it. Three years ago, my husband and I moved back to my college town. Three months ago, that friend cleaned out her garage and returned the infamous spool to me. My husband was baffled by its reappearance. All he knew was that it was thrown away twelve years ago and then suddenly reappeared on our porch.